There is a park near our home that has a spectacular public sandbox. 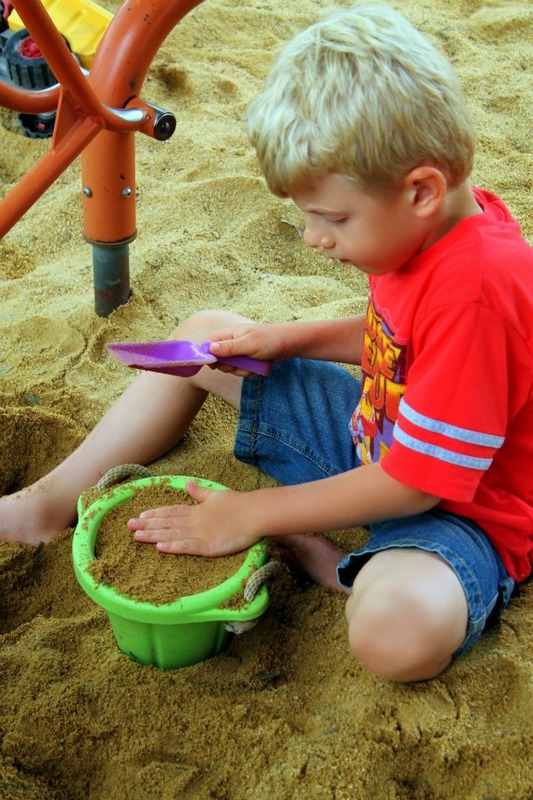 Public sandboxes are fun places to play and learn because the high quantity of children and sand-toys present many opportunities for preschoolers to develop life-long social skills. As parents, we sometimes forget that our children are not born with social skills. Children learn how to behave appropriately in social settings through direct instruction, observation/role-modeling, reinforcement, and empathy. As your child navigates new social situations, it is important to gently guide him and frequently give him the opportunity to practice new skills. Here are five important Sandbox Social Skills for preschoolers to learn, practice, and understand. 1. Ask before taking. I have been astonished this summer by the number of children who take toys from others without asking. Just last week, a boy took my son’s shovel right out of his hand! His mother saw him do it, yet said nothing about it. It is important to teach children to respect other people’s property. Polite words like “May I use your shovel?” or, “Are you playing with this truck?” should be used before taking a toy. Sometimes the other child will say yes, but sometimes they will say no. Help your child be prepared for both answers. 2. When you share with others, they will share with you. Sharing is a difficult social skill to learn, but a rewarding one! 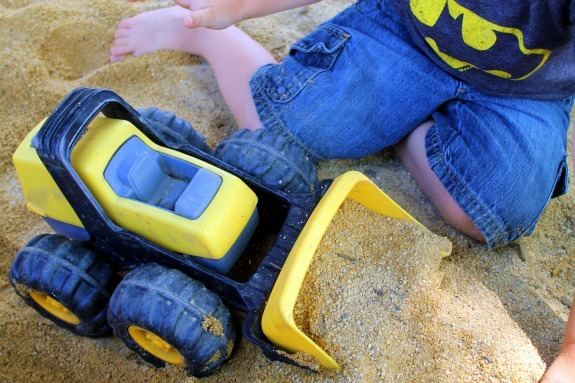 Owen was fortunate enough last week to have an experience in which he and another boy traded sand-toys, reinforcing to him that when he shares with others, they will share with him. I have taught my boys that if they do not want to share a toy because they are actively using it, they have the right to politely say, “Not right now because I am using it.” and then offer the other child a different toy to play with. 3. Do not throw sand. No one enjoys playing with a child who throws sand, so teach your child not to. Sand throwing isn’t nice and can lead to severe eye injuries. If your child is throwing sand and will not stop, please take action by removing her from the sandbox. When you feel she is ready, bring her back to the sandbox to try again. 4. Respect other kids’ sand creations. When Owen was one, we jokingly called him Owen the Destroyer because he impulsively wrecked just about every sandcastle and block tower that Colin built. Fun for Owen, but not so much for Colin who had put much time and effort into his creations. Since then, Owen has learned more self-control and now asks before wrecking. If the other child says no, he walks away from their creation or asks if he can play too. If he forgets our rule and destroys someone’s creation, he is expected to apologize and right his wrong by offering to rebuild it. 5. Use kind, strong words. Encourage your child to use kind, strong words to stand up for himself or ask for what he needs in the sandbox. If someone takes a toy that he was using, refrain from swooping in and retrieving it for him. Instead, help him find the right words to ask for it back. If your child wants to join other children in their play, encourage her to ask, “May I please play with you?” When I worked as a School Counselor, I often told my elementary students, “We don’t say you can’t play.” I have since taught Colin and Owen the same phrase. If another child asks to play with them, they include them because we don’t say you can’t play! Social skills instruction is always a work in progress and can vary from situation to situation. With practice and your support, your child will be able to navigate the sandbox, make new friends, and happily play with others. 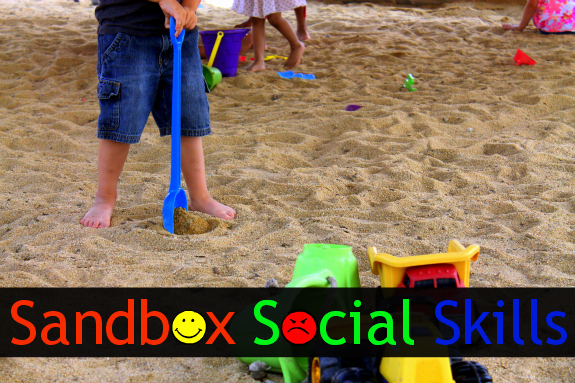 Do you have any additional Sandbox Social Skills that you would add to this list? I think we should be teaching children to “take turns” rather than to share. You can’t really share one shovel or one bucket, but you can take turns with them. Instead of saying no, I try to teach my son (21 months) to say “when I’m done.” If someone came up to me as an adult and asked me to share my iPhone, I’d say no. I’m not sharing it, it’s mine! But I’ll probably let you have a turn checking out the cool games or my pictures or something. I agree with not butting in to solve our kids’ problems but I often feel judged when I stand back and observe how my son is learning to interact with others instead of swooping in and doing everything for him. I especially have a hard time when other parents discipline my son for something their child should have been able to sort out on their own. A perfect post to use when you grow up too! What do they say? Everything I needed to learn in life I learned in preschool (in the sandbox!). It’s true! The “do not throw sand” social skill is critical, and very young children ARE capable of learning it. I’ve seen way too many parents giggle at their young child’s sand throwing because they think it is adorable (meanwhile, the other child is saying “stop! stop!” as their face is being whipped with sand – and no one else is thinking it’s very adorable by that point! ), or pretend that their child isn’t doing it – as if they ignore it, he or she will stop doing it. Social skills are all about teaching and reteaching until they are mastered! Anything that hurts another person’s body or feelings (like sand throwing) needs direct instruction (not “extinction” as ignoring the behavior is commonly called) and an appropriate, fair consequence – like time away from the sandbox. But with that said, it is also important to give a child many opportunities to practice new social skills after teaching and/or reteaching! Thank you for your comment! I think the share or take turns philosophy needs to be taught to more parents… not just the kids! I’ve seen so many parents come to the park, leave their kid’s toys in the sand, and then if my child wants to play with them… say, “no, those are ours”… but then still leave then in the sand not being used and roam away. It is like torture for my kids! Put them away, hold on to them. or don’t bring them.